A cranky old friend of mine told me the other day, that the older he became, the more certain phrases annoyed him. He told me that one expression that he was tired of, was the overused expression, “back in the day”. “That expression really rankles me,” he said. “That expression rankles you?” I said fumbling through my mental dictionary for a definition of ‘rankles’. This somewhat bizarre exchange occurred in the break room at the office where I work, and I took a quick step backward as my crotchety coworker brushed past me to thrust his dry Florida Panther’s mug beneath the water cooler spigot. Never get between a hard-core hockey fan and a water cooler. That describes my feeling toward “boots on the ground”, a catch phrase which, of course, refers to launching a real, full-fledged, military operation on foreign soil by sending in soldiers (who usually wear boots), and usually indicates that we, as a Nation, are ready to make a long-term commitment to a country or region, based upon real, though often fabricated evidence. Evidence that is more times than not spoon fed through the media to the general public. In order to keep the boots off of the ground we often instead, launch an air strike. An airborne attack has the advantage of inflicting massive damage (shock and awe), while making certain that NO boots touch the ground – supposedly. Boots on WHAT ground, I always want to say when I hear that tired expression circa. 2002. 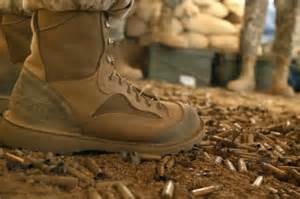 We have boots on the ground in the desert outside of Las Vegas launching drone attacks in Afghanistan, while we have had boots on the ground for the past decade in the desert in Iraq – fighting in a war that was started on some very shaky, if not downright underhanded pretenses. So don’t get my meaning wrong here. I am not saying that there is never a time for “boots on the ground”, and I certainly mean no disrespect to those wearing the boots (anyone who reads my work knows that I am committed to the cause of better treatment for our veterans), but I fear that this Syrian mess is not one of those times, or so it seems to me, and unless I have been inhaling too much Florida swamp gas, it will soon prove itself to be just that. This is a debacle in sheep’s clothing and I hope that we discover that before the first boots hit the ground. “Boots on the ground” is exactly the phrase that has led me recently to thinking that we (or those in, or seeking, the public spotlight) may be trending toward speaking in tag words, even subconsciously, although I suspect every word the President utters is carefully selected for SEO*. Back in the day* (you know I had to say that), we called them buzz words,* often employed rhetorically to fit sound-bites* for the evening news. In our multi-access point* society, we are even more exposed to their repetition and they become more easily integrated into our own lexicon and, perhaps, thought processes. I’ve had the hardest time resisting describing — for an audience that is casually interested at best — my role in a recent project without using the term ‘boots on the ground,’ although it is the most efficient metaphor. When it comes to mind, I pause to consider why that would even be sitting inside my head! More to the point, Florida has hockey fans? Who knew. * Yes, all of those annoy me, too. Thank you for taking the time to comment, Hippie Cahier. I had not thought of it until you mentioned it here, that probably the President (and most other elected officials) choose their words with SEO in mind! I work for a very large corporation and we have sooo many buzz-words it will make your head spin – and usually does. I guess I get weary of it all sometimes. And yes, there are hockey fans here in Florida – they are not quite as fanatical as the Islanders fans that I knew when I lived up in Long Island some years ago, but they are pretty dedicated to t he sport.